This is the truly remarkable life story of the notorious Ethel Livesey, a serial fraudster and confidence trickster who became a media sensation after she ran out on her society wedding in 1945 and later was arrested for obtaining goods by false pretences. 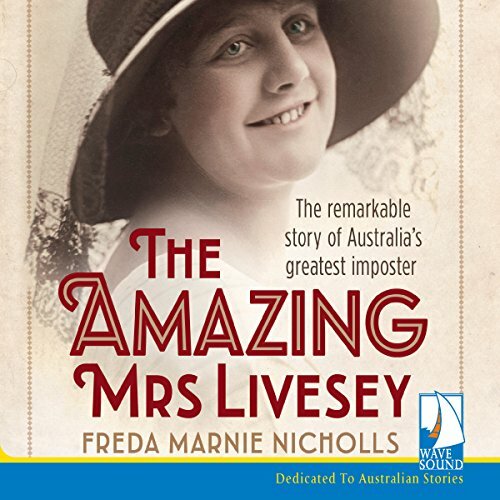 With a prologue by Ethel Livesey's granddaughter, this extraordinary tale of Australia's greatest fraudster is told for the first time in rich and fascinating detail. Ethel was definitely fascinating. Yet I would best describe her as a narcissistic con artist, albeit a flamboyant one. She took advantage of people left right and center and couldn't tell the truth if she tried. She seemed to believe her own lies, she always saw herself as the victim and never acknowledged that she hurt others, not even in the abandonment of her own children. This deed being the most unscrupulous of them all. Ethel obviously had mental/personality disorders combined with amazing storytelling and acting abilities. Her lies and performances charmed so many people into giving her what she wanted that I was shocked to hear of person after person falling under her spell. Was she really that convincing or was she just highly skilled at sniffing out exceptionally gullible people? Mrs Livesey's misdeeds didn't always go smoothly nor did they go unnoticed by the law. I had to wonder how, in the end, she could possibly believe that her antics were worth continuing after all the trouble they would cause? Despite her saying that she wanted fresh starts ofteb, rehabilitation was beyond her. I found the writing to be excellent as I was thoroughly engaged throughout. The narrator did a marvellous job too, using different voices for the vast array of characters. I did find the court proceedings outlined toward the end a little long winded and drawn out. Yet on the flip side this served to emphase just how complicated and difficult Ethel eventually made life for everyone, including herself. I don't know how much, if any, creative licence was taken by the authour with this book because it is certainly pieced together with great detail. Nevertheless, I was totally captivated and must commend both the authour and the narrator for their exceptional work. Interesting book. spans several years but definately held my attention. Ella James is an excellent narrator, with an easy to understand voice, not choppy.